AMERICAN Built Hennessey Venom GT is Fastest Car in the world. 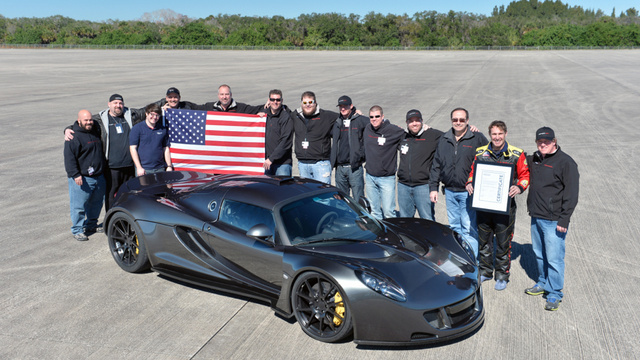 On February 14th, at the Kennedy Space Center in Florida, the Hennessey Venom GT just became the fastest production car in the world. Chronicled by Matt Hardigree over at Jalopnik, the feat was impressive to say the least. 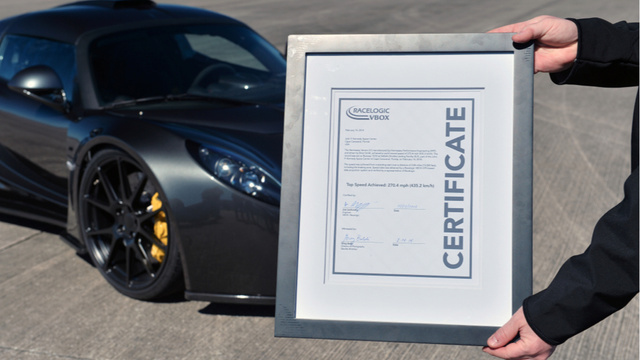 "While under command of driver Brian Smith on February 14th, the Venom GT sent a love note to Bugatti by way of a a 270.49 mph pass on the 3.2-mile shuttle landing way. It's one of the few places where there's that much uninterrupted pavement not surrounded by cops, other cars, or stray animals. Because NASA requires there to be some scientific purpose for runs on their property, they were "testing" Pennzoil's new synthetic motor oil, which is made from natural gas. NASA, however, wouldn't let them run in both directions they claim, so Guinness won't certify it. The technicalities of 'fastest' get a bit ridiculous. So how does a car get to 270 mph? The Venom GT starts life as a relatively lowly Lotus Elise — a car known for being light and quick. They do their best to maintain 'light' by keeping the weight down to a spritely 2,743 pounds. That's lighter than a Honda Civic. Where it differs from a stock Elise is in the power. Try 1,244 from a specially modified GM V8 engine that's been twin-turbocharged and modified to eek the last bit of power out of it. The cost of all this? About $1.0-million, which is sort of a deal. So far they've only built 11 of these, with 30 planned (the minimum to be considered "production" by most standards)."